A pie must have a bottom. A pie must.....please let's STOP! I don't do poetry. But I can research and tell you the story of the "pot pie". So, let's get started. "was a flat crusty galette made from ground oat, wheat, rye, and barley and was filled with honey. It was baked over hot coals." Three-thousand plus years ago, royal bakers for the pharaohs of Egypt added some fruits. Drawings of this can be found in the Valley of the Kings, etched on the tomb walls of Ramses II. We are told that the Greeks nudged in a bit of meat, but...that still sounds like dessert to me. So, where's the beef? Leave it to the Romans to assimilate the food of the Greeks and add their own decadent spin. They created a galette filled with meats, oysters, mussels, lampreys, and fish. But there's one problem. They tossed away the crust. Unlike the flaky pastries that we make today, the crusts of the Romans were little more than a mixture of flour and olive oil. They were rock-hard and not meant to be a part of the meal, they were little more than a convenient vessel. Something as wonderful as meat pies (even if the crust is inedible) is difficult to contain. The state of the crust improved somewhat in Northern Europe. There the locals grew wheat and raised their own sheep, pigs, and cattle. And instead of olive oil flour was mixed with butter or lard. With these winning ingredients, a proper meat pie was finally born. But they weren’t being called pies, at least, not yet. These wonderful meat-filled pastries were called coffins (yes, just like it sounds, meaning a box). Members of royalty (of course) took even this humble dish to the next level. Songbirds were often cooked and used to “adorn” the top of each coffin to indicate the type of filling contained therein. (Perhaps “four and twenty blackbirds baked in a pie” is not merely a nursery rhyme). …the finer things in life included not just art and music but also sophisticated items of food and drink. 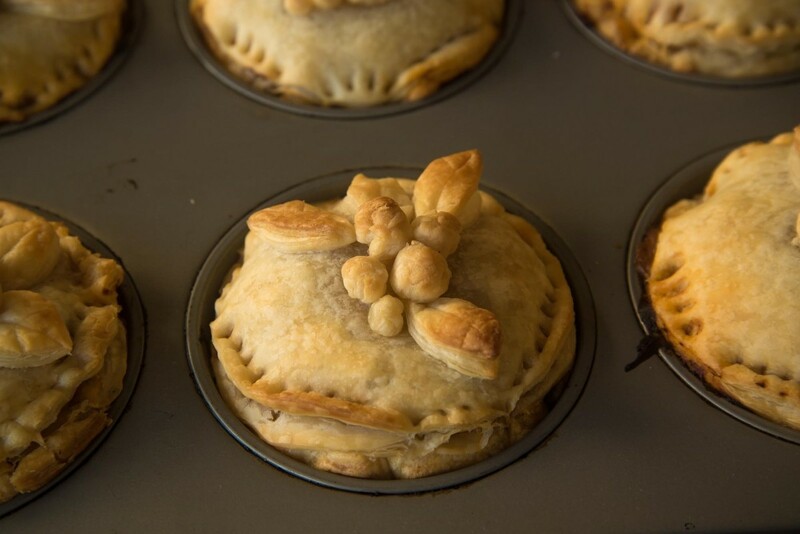 Meat pies were now an art form. Refined wheat flour was lower in gluten and thus could be shaped and sculpted into works of art. Flour, fat, and water were now being fashioned into birds, beasts, fish, flowers, and castles; colors were added with the use of egg wash, saffron, and even real gold. Meat pies were not so gaily adorned. And, under edict of the Pope (who believed that meat enflamed sexual passions) animal flesh was replaced by the fruit of the sea. Fish pies became common. But this, in turn, helped the fishing industry to prosper, so some good resulted. The pie was part of life in the Victorian era. The Industrial Revolution mass produced pie moulds. The type of pie distinguished the social classes. Game pies and fish pies were available to those who had land and hunting rights and the poor and working class could only eat mutton from old sheep or beef pies from dairy or draft animals. Pigeon pies were available to people of high status because only the rich were able to raise pigeons for supply of meat in the winter months. In America however, pigeons were abundant and available to anybody with a rifle. Two world wars altered much of history, including the history of even something as mundane as the pot pie. Families were no longer sitting around the dining table each evening, and mothers were now working in factories and assembly lines. The tradition of working long hours each day to produce a family meal had become a thing of the past. 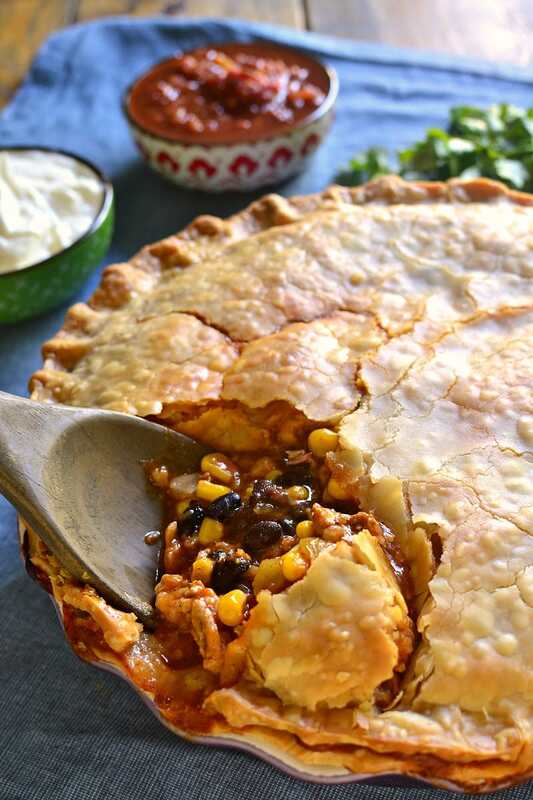 After World War II (in 1951) the Swanson Company began to produce chicken pot pies, individual meat pies available in the frozen food aisle of every grocery store. Meat pies were reintroduced to the American dinner table and the rest, as they say, is history. 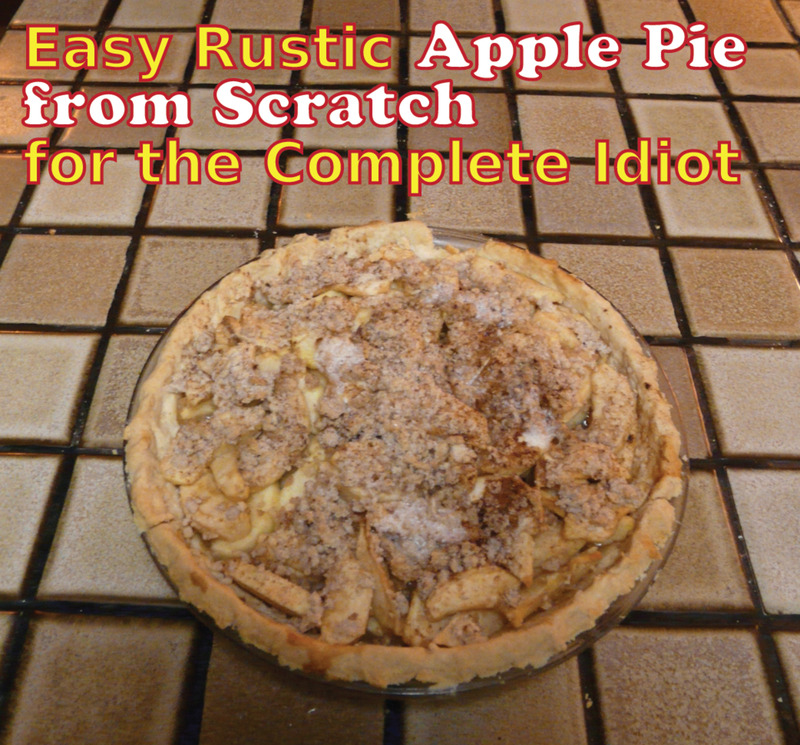 This is the only recipe I use for making pie crust. Olive oil is a much healthier option than shortening, butter, or lard, and since it's a liquid there is no pesky "cutting in" involved. 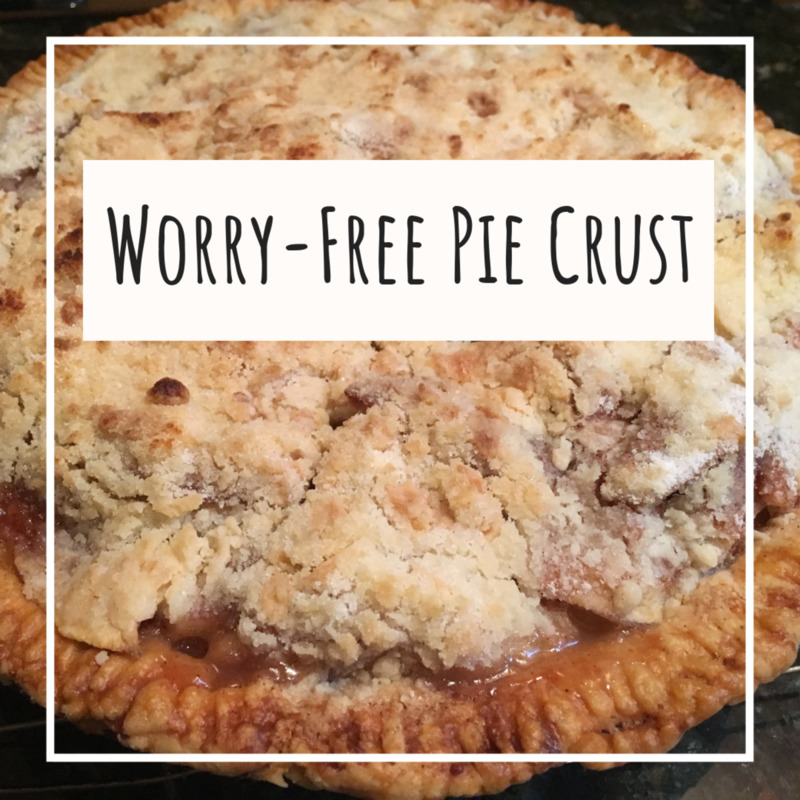 The blog SmellsLikeHome has an easy-peasy incredibly buttery pie crust recipe. This would be the perfect rich pastry to pair with your meaty, full-of-gravy-and-veggies pot pie. I love the blog TwoPeasAndTheirPod. Maria and Josh never disappoint with their collection of easy, family-friendly meal ideas. 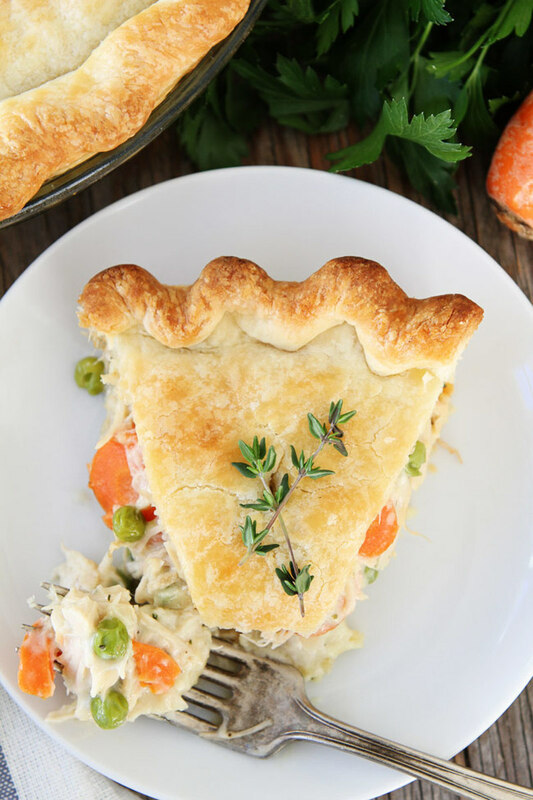 Their Chicken Pot Pie is a winner-winner chicken dinner in my book. 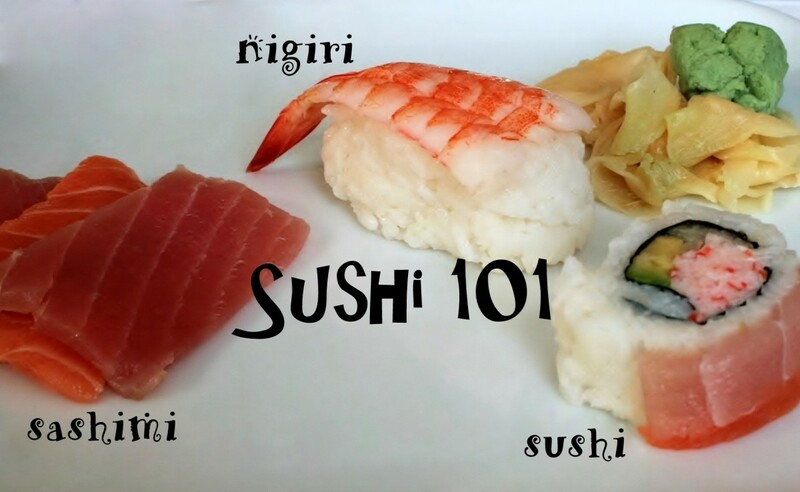 This recipe appears on countless blogs and websites, but none of them credit the origin. This recipe was originally published in Sunset Magazine, March 1997. (I know because I still have that issue). In a 2- to 3-quart pan, cover rice with 1 2/3 cups water. Bring to a boil over high heat; cover, reduce heat and simmer 15 minutes. 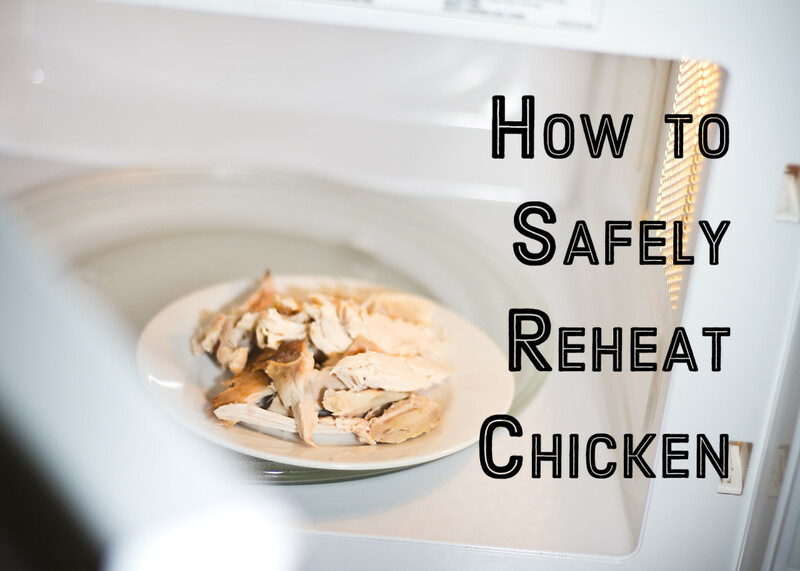 Remove from heat; let stand, covered, 15 minutes. Meanwhile, mix 1 cup broth with oyster sauce, cornstarch, garlic, and pepper flakes; set aside. 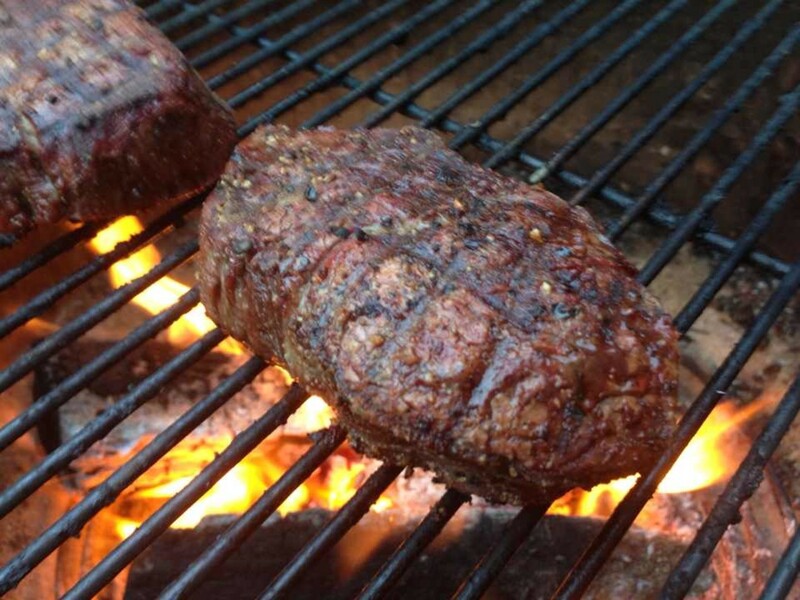 Thinly slice steak across the grain into 1/8-inch thick slices. Add oil to a 10- to 12-inch nonstick frying pan over high heat; when hot, add meat. Cook, stirring constantly, until meat is no longer pink, about 4 minutes. Add remaining broth, stir-fry vegetable mixture, and onions. Cook, covered, just until vegetables are bright green, about 3 minutes. Stir seasoned broth into meat mixture; bring to a boil. In a bowl, combine rice with meat-vegetable mixture; spoon into a 10-inch pie dish, 9-inch square pan, or 1 1/2-quart baking dish. 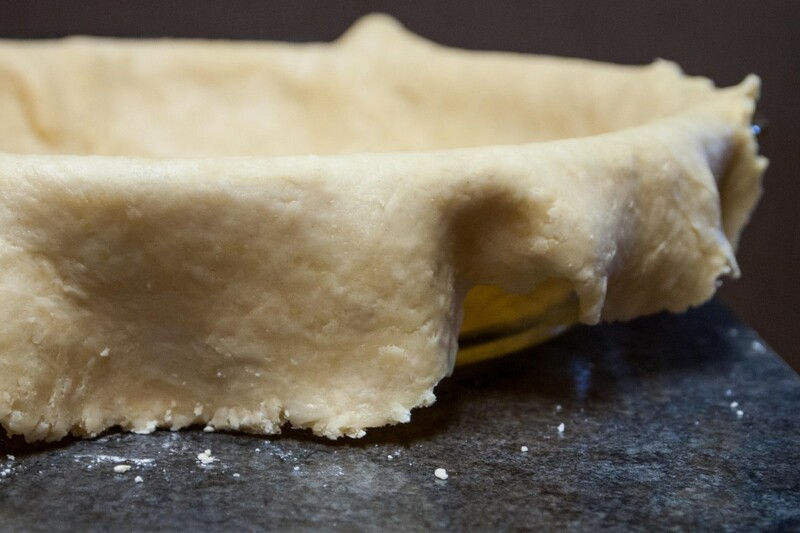 Unfold pie crust according to package directions. On a lightly floured board, roll into a 12-inch round for pie dish or a 1 inch larger than dish of another shape. Place over beef and vegetable mixture; fold edges under and flush with pan rim, and flute firmly against the rim. 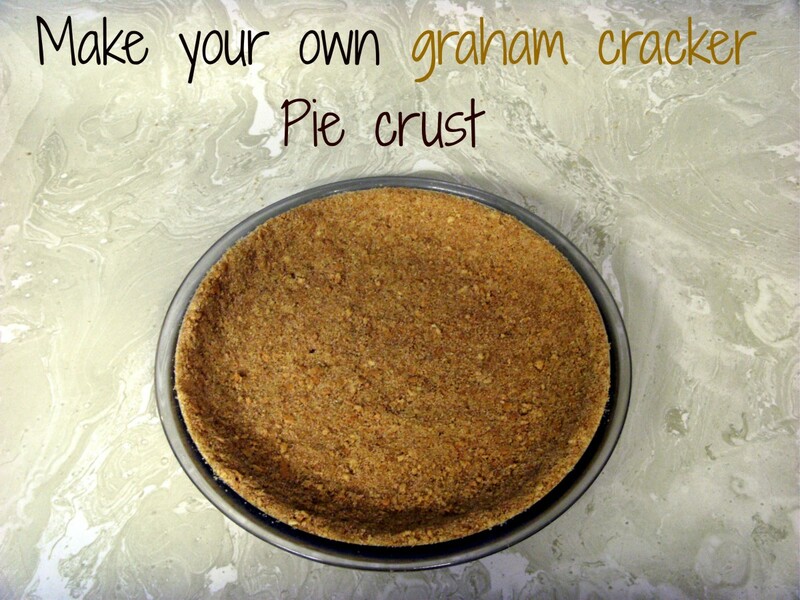 Cut shapes from crust and decorate the top, or make a couple of decorative slits in crust. Bake in a 350 degree F. oven until filling is hot in center, about 1 hour. Lay foil over crust if it begins to over-brown. Let cool about 10 minutes; spoon from the dish or cut into wedges. Imagine all of the flavors that you love in a taco. Now imagine all of those flavors snuggly tucked between two buttery flaky layers of pastry. Cathy of LemonTreeDwelling makes it all possible. 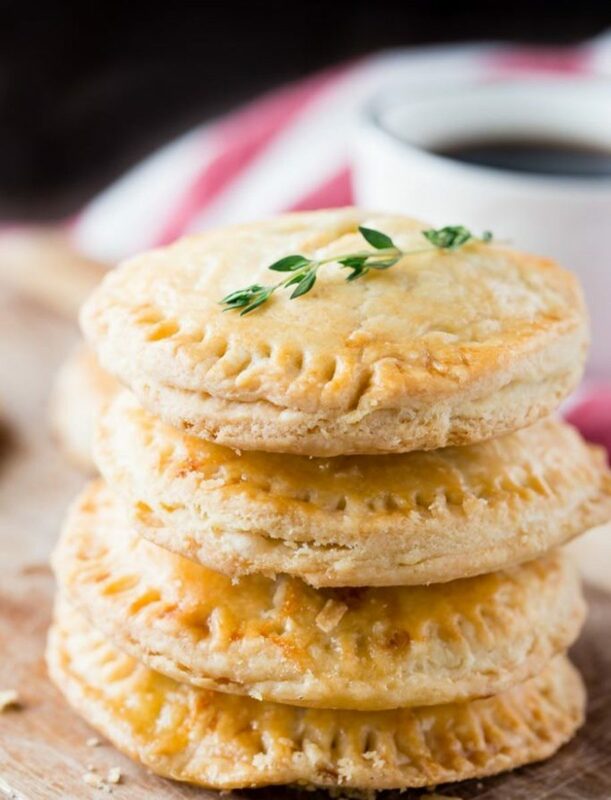 Although these ham and brie hand pies by CookingOnTheFrontBurners could be a "grab and go" breakfast, I wouldn't recommend it. They're much too good. These should be savored slowly on an unrushed (weekend, perhaps?) morning with the daily newspaper, a kitty on your lap (or puppy at your feet if that's your preference), and a good cup of coffee or tea. This isn't really a pot pie, and it isn't really a pizza. It IS a total mash-up of the two and is probably one of the most decadent foods I've seen on the internet in a very long time (and believe me, I look at LOTS of food on the internet). 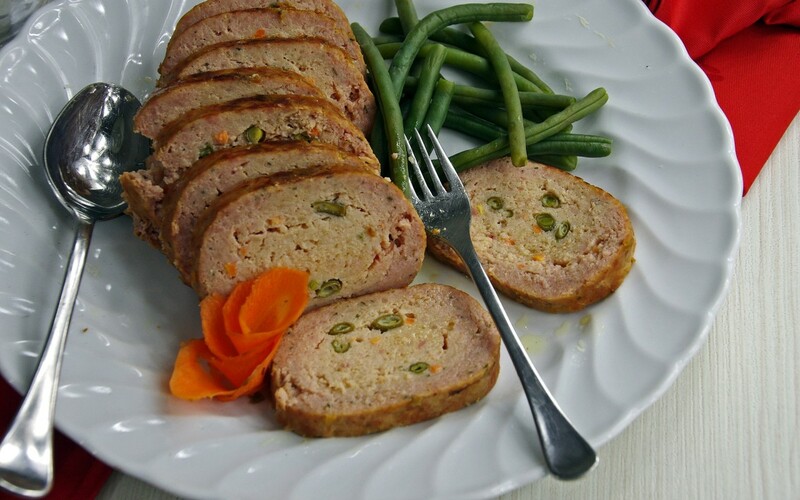 MyHoneysPlace created this crazy dish which bakes in the oven with the bread on top; when it's done, you flip it upside-down and the filling in the ramekin drops into the crust on top which has formed a bread bowl. 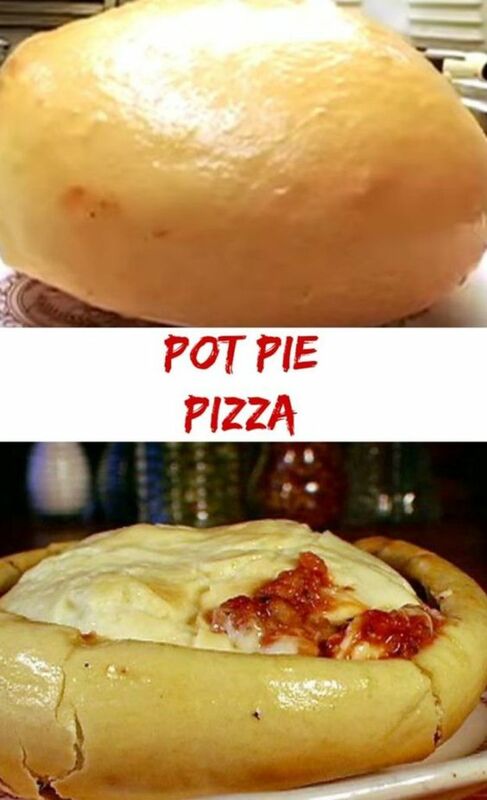 Lady's and gentlemen, I present to you the Pot Pie Pizza. Watch the video and drool. The roasted mushrooms in this pot pie from TheCookieWriter are so full of rich, umami flavor you won't miss the meat. 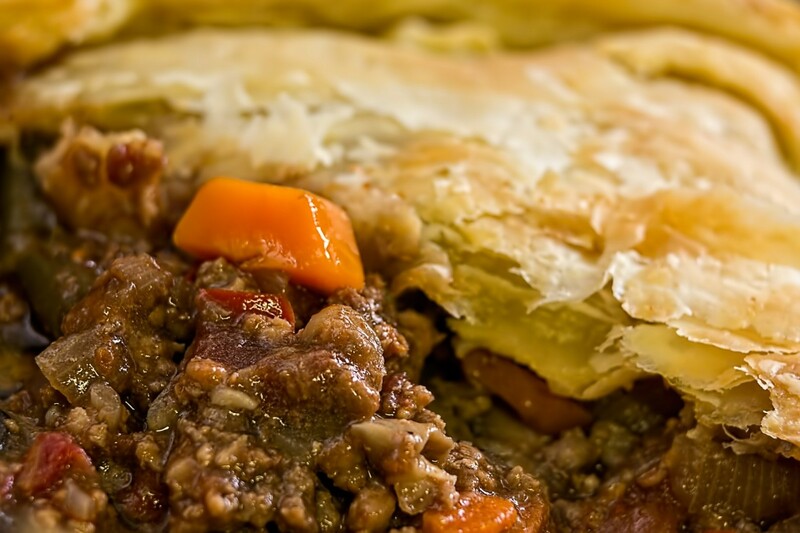 The first time I tasted a beef pie was in Victoria, British Columbia. This quaint little city isn't London, but it's about as close as I can get without a plane ticket and a frisk from TSA. The pie was in a little off-the-beaten-path bakery, just a single serving. I could have finished it in minutes, but after that first bite, I knew this was something I wanted to linger over, to savor and enjoy every luscious bite. And before I left Victoria, I went back and had that pie twice more. I've never even dared to replicate that dish. It's almost like treading on hallowed ground. But I think this recipe for Beef Shin Pie might be ever so close. (By the way, if the term "shin" is foreign to you, in the States you might recognize this cut as beef shank). Which pot pie will you choose? Hi Shauna, yes I use the olive oil crust recipe for everything, even dessert pies. Unless you are using an expensive fruity olive oil, they have a pretty neutral taste. No, not quite as flaky as butter, but a lot easier to work with (and I'm all about easy). I love pot pies. 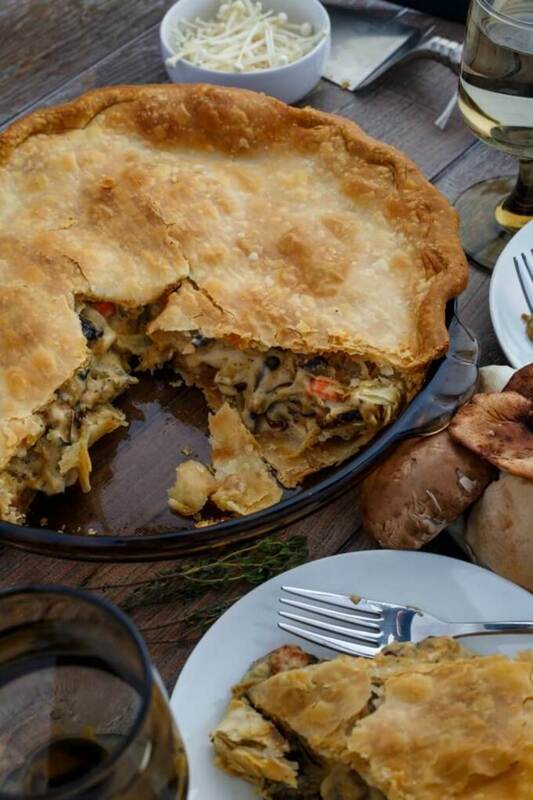 I usually opt for chicken over beef, but the roasted mushroom pot pie sounds delicious! Linda, do you make your olive oil pie crust for use in sweet pies as well as savory ones? Can you taste the olive oil? Is the crust as flaky as one using butter for the fat? Good morning Eric. Yes, this was a fun one to write. Marie "whats-her-name" did say that (or so we've been told), but the cake she was referring to isn't what we call cake. (That's another story for another time). Glad you and Gabe will be working on some of these together. Well OK Ms. Lum. I was a fairly poor chap in college and my previous wife and I grew a garden complete with out chickens. We swapped eggs for beef. My lady would do pot pies. I did not appreciate the eggplant ones much but more than being hungry. I will cook the chicken, beef and pizza ones and my boy can help with these so that is a huge bonus. It is so cool these were "church politicized". Wasn't some Marie gal who said "let them it cake"? Hi Mary, I think just a side salad or some fresh vegetables would even out the menu. You already have your meat/protein and carbs (the crust and in some cases potatoes). I don't think you can ever have too many veggies. Or, fresh fruit would also be a tasty side dish. 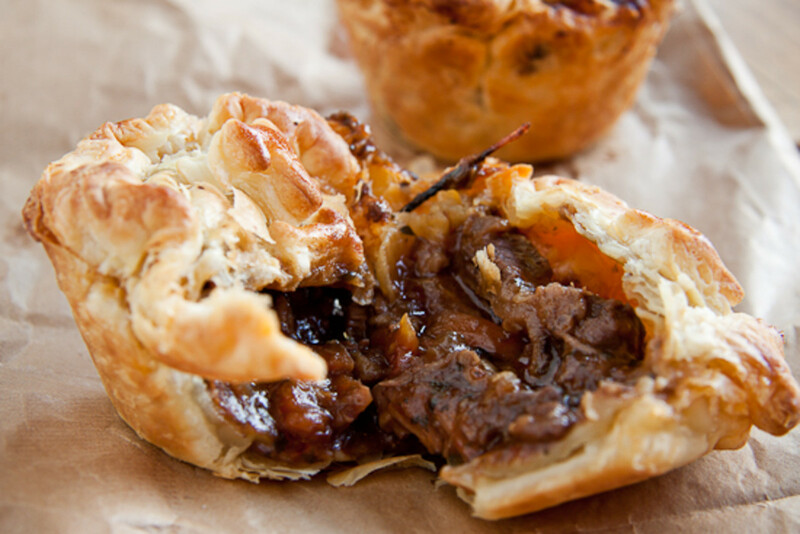 For me, I would choose the mushroom but to keep the peace in the house, I'd opt for beef shin pie. I need to make these, as I have been lazy of late. I will make the filling and then make rice, potatoes, or pasta. What would you suggest to eat with the pie, as it seems to have everything included but to just serve the pie, doesn't seem enough? I too make an oil crust, as our humidity and heat are both high here. I normally always have success with it. I have never used olive oil though, as I usually make crusts for fruit or other sweet pie. Flourish, you might want to consider the roasted mushroom pie. Although, myself I tend to associate pot pies with wintertime and blustery weather. Unless you are still vegan, the brie (sans ham) might be enjoyable. Bill with all that you do on the farm it's difficult (impossible) for me to imagine you putting on weight. Last time I saw you, you were slim and trim. When I ate beef a looooong time ago, I used to enjoy a hot pie called hamburger pie and another called spaghetti pie. You bring back the memories!